When children experience communication disorders, they are often placed in inappropriate academic settings. 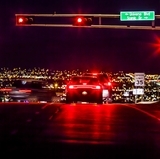 New research being done at UNM uses iPads with special communication apps. 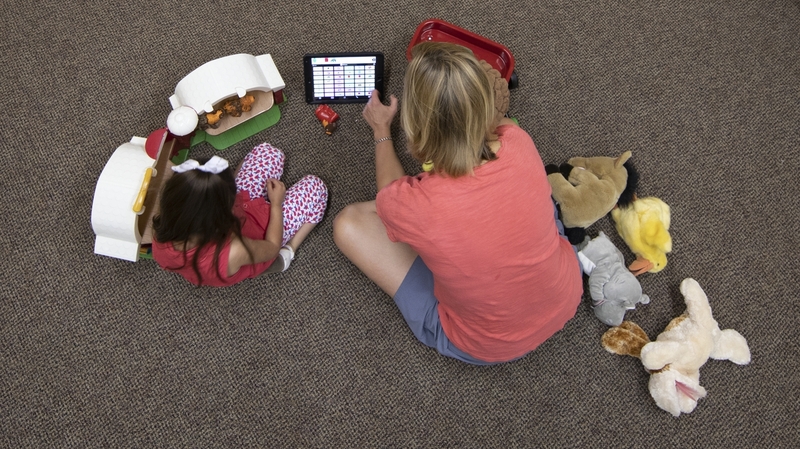 Therapists use toys and games to help clients learn how to better use the communication apps. 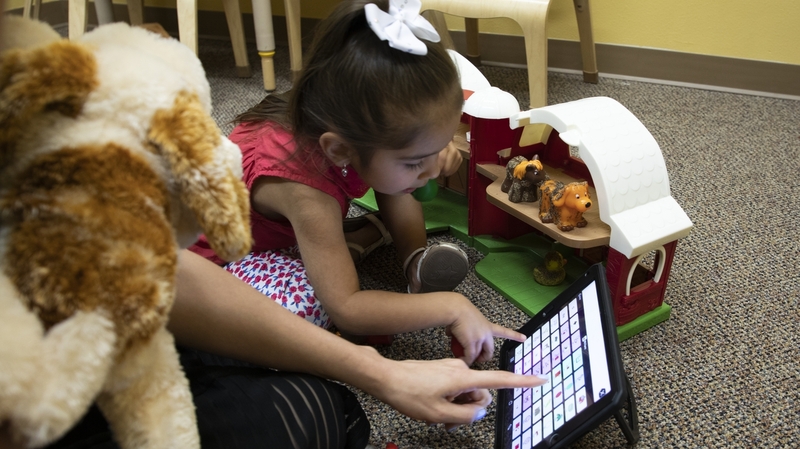 Through several levels of therepy and intervention, researchers are helping children with communication disorders use iPad apps to construct sentences. In the United States, about one in 12 – or eight percent – of children have communication disorders. 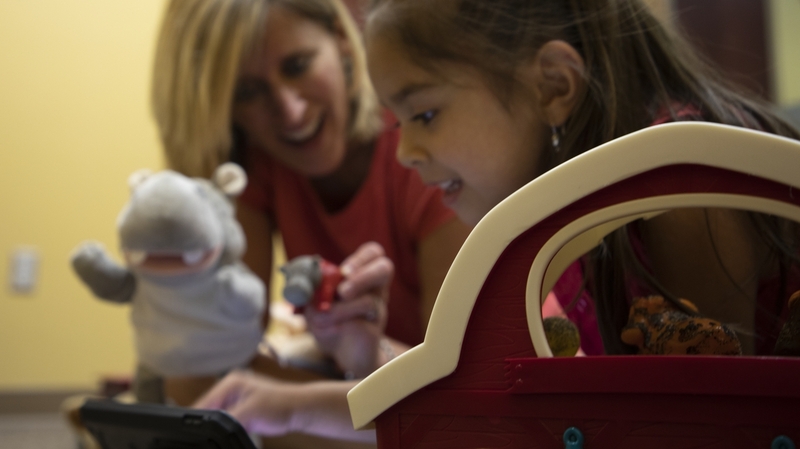 Researchers at the University of New Mexico and the University of Central Florida were recently awarded a National Institutes of Health grant to study how language therapy, combined with technology, can help kids with severe speech disorders communicate more effectively. Cathy Binger, UNM Associate Professor of Speech and Hearing Sciences, and Jennifer Kent-Walsh UCF, Professor of Communication Sciences and Disorders, will study what level of instruction and intervention is needed for children with severe speech impairments to maximize the capabilities of commercially available apps that verbalize words for a user. Apps currently on the market allow a user to select images in sequential order that represent the words the user wants to communicate, and the app then verbalizes that sentence. “If a young child with unintelligible speech, or no speech at all, comes up to you with an iPad and starts speaking to you in full sentences, this creates a big mind shift about what that child is truly capable of doing,” said Binger. However, the evidence base to support training options and use of these tools is limited – but growing – thanks in large part to the work of Binger and Kent-Walsh. 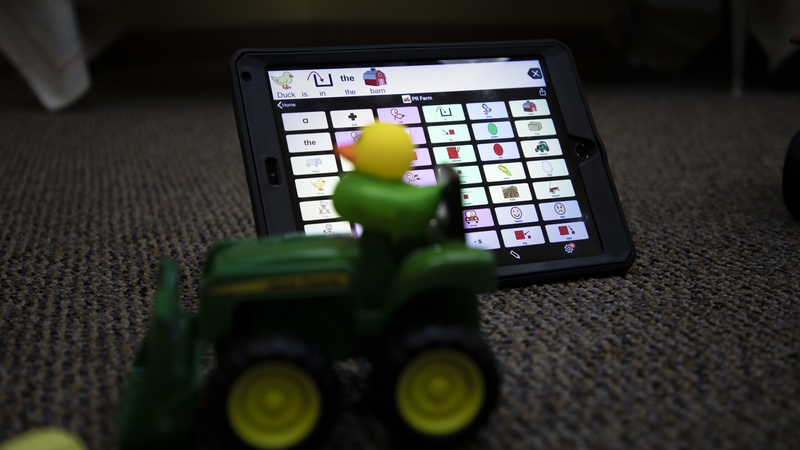 “This grant is the culmination of many years of work and a lot of pilot data showing that it is possible to teach children to use picture symbol-based apps to communicate in grammatically accurate phrases and sentences,” Kent-Walsh added. The goal of their research is to better understand how to support the development of children with severe speech impairments. Children with disorders like Down syndrome, cerebral palsy or childhood apraxia of speech could benefit from this research, as well as any child whose communication needs are not being met. Binger and Kent-Walsh’s research will focus on 3-and-4-year-old children who have severe speech impairments. At the onset, participating families will receive basic instruction in how to use the communication app, while some participants also will receive enhanced intervention sessions led by Binger and Kent-Walsh that are aimed at teaching them how to “speak” using the app. Results from each group will be compared to determine if the enhanced intervention had a positive effect on the child’s ability to communicate. 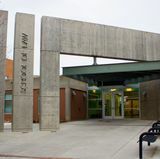 “We are thrilled to have come to a point where we are ready to roll out this intervention on a larger scale and track the communication performance of many children across states,” Kent-Walsh said. The hope is that by providing these children with the necessary technology and instruction to more effectively communicate, the children will be able to take full advantage of the same educational and social opportunities as their peers, which may, in turn, allow them to lead more fulfilling and successful lives. “The University of New Mexico is on the cutting edge of research to improve educational outcomes for every student in New Mexico," said U.S. Senator Tom Udall, when he learned of Binger and Kent-Walsh's grant. "I’m pleased UNM was awarded this grant to carry out research to ensure young children with communication disorders are able to access new tools to help them communicate and learn more effectively." The research will take place at UNM’s Speech and Hearing Clinic and UCF’s new Florida Alliance for Assistive Services and Technology (FAAST) Assistive Technology Demonstration Center facility. Binger and Kent-Walsh are seeking preschoolers with significant speech impairments to take part in this study (NIH#: R01DC016321) and a related study also funded by the National Institutes of Health (NIH#: R15DC014585). 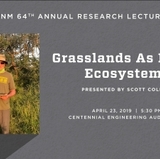 Those interested in participating at UNM should contact Binger at cbinger@unm.edu. Those interested in participating at UCF should contact Kent-Walsh at jkentwalsh@ucf.edu.